Scott Shades, president of Aisin Drivetrain; Gov. Eric Holcomb; Melissa Sauer, executive director, corporate affairs and communications, Allison Transmission; Allison Karns, managing director government relations, Allison Transmission; Ken Morris, director of sales, ADVICS; Misti Rice, executive director of government affairs, Magna; and Raga S. Elim, senior counsel, government relations Americas, Sabic. 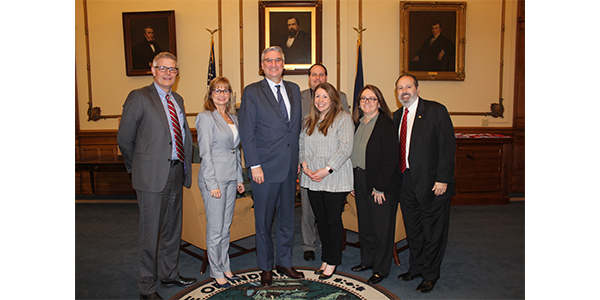 Indiana Governor Eric J. Holcomb was honored on Jan. 23 by the Motor & Equipment Manufacturers Association (MEMA) as the 2019 recipient of the MEMA State Leadership Award, a special recognition given to state elected officials who have shown outstanding leadership on behalf of motor vehicle parts suppliers. MEMA and its four divisions – the Automotive Aftermarket Suppliers Association, the Heavy Duty Manufacturers Association, the Motor & Equipment Remanufacturers Association and the Original Equipment Suppliers Association – represent an industry that directly employs more than 871,000 Americans. The award comes at a time of unprecedented change for the industry, as it adjusts to swift advances in technology and a changing global market. Indiana is the third-largest state for employment in the motor vehicle parts supplier industry, with more than 88,000 residents employed by motor vehicle parts suppliers. Overall, the industry contributes nearly 3 percent of the U.S. gross domestic product. Employment by suppliers in the U.S. is up 19 percent since 2012, generating a total direct and indirect employment impact of 4.26 million jobs. Governor Holcomb, a Republican and veteran of the United States Navy, was elected in November 2016. He led the way for the largest long-term infrastructure investment in Indiana’s history with the 20-year “Next Level Roads” program, which will invest $4.7 billion for roads and bridges in the first five years. He also has championed the “Next Level Jobs” program to help get more Hoosiers into high-demand, high-wage jobs. He has a mission to make Indiana competitive in the global economy by “bringing the world to Indiana and taking Indiana to the world.” So far, the governor has met with officials and industry leaders in the United Kingdom, Japan, Italy, France and more to showcase Indiana’s assets and build global economic ties. The MEMA State Leadership Award is given for outstanding assistance to the motor vehicle supplier industry by an elected official, who is nominated by a MEMA division member and approved by the MEMA Board of Directors. Past MEMA State Leadership Awards have been presented to Gov. Jay Nixon (D-Mo. ), Gov. Steve Beshear (D-Ky.), Gov. Rick Snyder (R-Mich.) and Gov. Nikki Haley (R-S.C.).